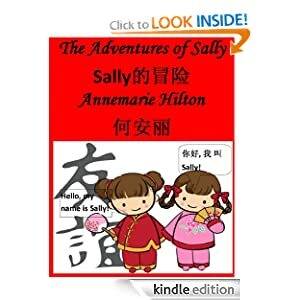 When Annemarie Hilton was just 8 years old she wrote a book about “the life of a 2nd grader.” The book spans one year during which the protagonist “has lots of adventures like stopping a bully and almost cutting her finger off,” describes the author of her work. One language, however, wouldn’t suffice as a means for this Utah county student to express herself. Annemarie, now 10 and entering the 5th grade is studying Mandarin through Utah’s Dual Language Immersion program. This summer, at the urging of her father – John Hilton III, one of our parent council’s regional vice presidents – Annemarie translated her book in Chinese. “She has worked really hard on it (60+ hours this summer) and finally finished the editing today. We uploaded it to Amazon and she is now a published author!” said her dad on Wednesday. Annemarie said she knew some of the words, but had to look up others on Google Translate. “It’s not perfect, but I hope you will like it whether you read it in English or Chinese or both!” she writes in the book’s introduction. Check it out with your kids. It sells for just $2.99 and Annemarie is donating some of the proceeds to buy Chinese books for her school library. Perhaps it will inspire more budding writers to put their Mandarin to practice. This entry was posted in Uncategorized and tagged Chinese, dual immersion, Mandarin, student author, Utah on July 25, 2013 by diparents. Portland Public Schools is considering adding Vietnamese to its immersion program, reports the Oregonian. This entry was posted in Uncategorized and tagged language immersion, Portland, Vietnamese on July 22, 2013 by diparents. First The New York Times, now Time Magazine. Utah’s language immersion program is growing and continuing to draw national attention. The neurological benefits of bilingualism are well researched and comprehensively described by Kruger. But my guess is that parents enrolling their children have myriad motivations: from preparing their children to succeed in a globalized economy to expanding their academic and cultural horizons. Time Magazine has a pay wall, but here’s a teaser to entice you to read more. It’s worth the money! “All over Utah, elementary-school students are joking and studying and singing and reading and fluently speaking in languages not their own: French, Spanish, Mandarin Chinese and, soon, Portuguese. They are part of one of the most ambitious total- immersion language-education programs ever attempted in the U.S. It kicked off in the 2009 school year with 1,400 students in 25 schools and by this fall will include 20,000 kids in 100 schools–or 20% of all the elementary schools in the state, with nearly 95% of school districts participating up through grade 12. ….. This entry was posted in Uncategorized and tagged bilingual, Gregg Roberts, Jeffrey Kluger, language immersion, Time Magazine, Utah on July 19, 2013 by diparents. Your kids read books in English, why not Chinese? A great post by our sister organization in San Francisco with recommendations for where to obtain grade-appropriate books in Mandarin. Featured are grade-level readers produced by our own Brigham Young University and http://www.chinasprout.com – the official bookseller of my kids’ school. I would also direct you to the online STARTALK summer reading camp, which features video and audio “read along” versions of Mandarin books, organized by grade level. Also available is an English translation for parents and online and printable activities. This entry was posted in Resources and tagged books, Mandarin, reading, STARTALK, summer, Utah on July 8, 2013 by diparents. Only in New York would you be able to find a Mandarin immersion lego engineering program! Wish they had something like this here. Use or it, or lose it. It’s not easy to force yourself to speak a language different from the “mother” tongue of those around you. Not even for an American English teacher living in Spain who had best intentions of raising a bilingual son. “Shortly after the 165 high school students from around the state of Virginia arrived on Washington and Lee University’s campus last weekend, they made a promise, in writing: no cell phones, no iPods, no iPads, and no English for the next three weeks. The students are participants in three Virginia Governor’s Language Academies in Spanish, French and German…. This entry was posted in Uncategorized and tagged bilingual, Chinese, Lego, summer camp, Washington and Lee University on July 1, 2013 by diparents.